Ackermann’s Repository of Arts, April 1819. 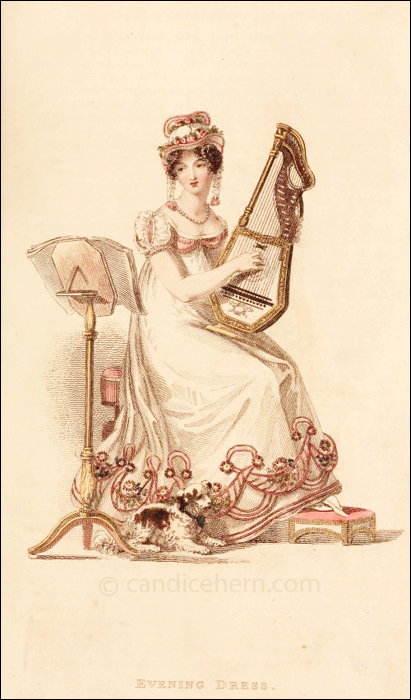 There are so many interesting elements here, not least of which is the musical instrument. But also note the little dog, almost lost (visually) among the fussy decoration of the skirt. 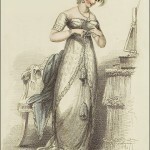 And, as is so often the case in fashion prints of this period, the lady’s feet are impossibly tiny! 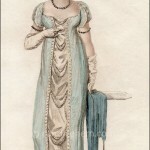 This late Regency period uses a lot more ornamentation in skirts, sleeves, and hats. 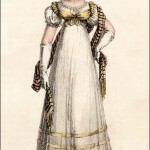 Bodices for evening wear are so abbreviated as to be barely there. (One always wonders if this is an exaggeration of the artists, or if bodices really were ridiculously small. A full-bosomed woman would certainly have difficulties with this style!) And evening hats are seen more often than in earlier years. Come on, all you fine women out there. Let’s go round up some lute-harps!